"The data rates that we're aiming for this demonstration are 200 gigabits per second, 200 billion bits per second," says Bryan Robinson, associate group leader of the optical communications technology group at the lab. Stephen Hawking was passionate about human exploration beyond our own planet. Now NASA is working on better ways for future missions to send back what they see. It's aiming to test out technology which could allow live, high-definition video to be transmitted from Mars to Earth using lasers. NPR's Joe Palca has this story. 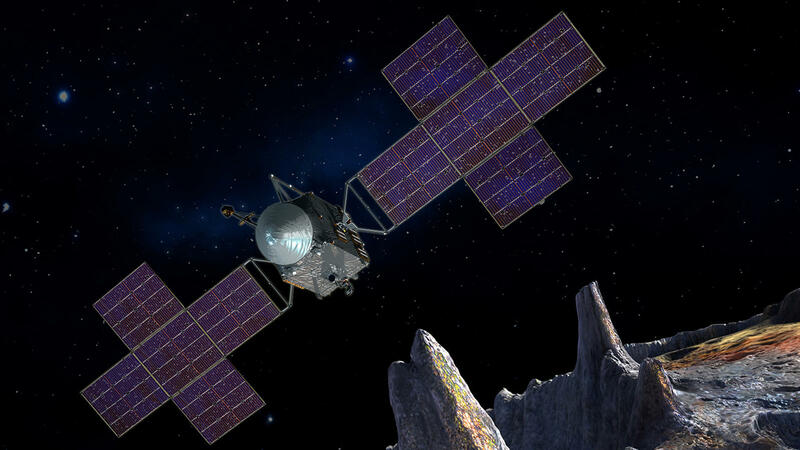 JOE PALCA, BYLINE: All spacecraft have carried some kind of radio to send signals to Earth. The farther you get from Earth, the weaker the signal. For example, this is the best NASA could do with radio in 1969 when Neil Armstrong stepped on the moon. PALCA: But here's what a broadcast from the moon can sound like now. CHARLES BOLDEN: Hello, this is NASA Administrator Charlie Bolden. PALCA: Bolden wasn't actually on the moon. Instead, a video he recorded was beamed up to the moon and back to Earth in real time. The signal wasn't sent by radio. It was sent using light. BOLDEN: This lunar laser communications demonstration is the first time we've used this revolutionary new system to transmit video to and from the moon. PALCA: Using light to transmit information at high speeds is nothing new. You might have fiber optic cables carrying the Internet to your house. But in space, a laser is used to send the light signals. In this case, a NASA spacecraft pointed a laser beam at a telescope back on Earth and was able to transmit huge amounts of data, enough for a live, high-definition video. And NASA doesn't want to stop at the moon. It's got its sights on Mars. KEVIN KELLY: I think the biggest challenges by far have to do with distance. PALCA: Kevin Kelly is CEO of LGS Innovations just outside Washington, D.C., a company that's building part of the laser system NASA is planning to put on a mission out past Mars. Kelly says the moon is only about 240,000 miles from Earth, Mars is about 140 million. And from Mars, Earth appears as a small dot. KELLY: Keeping this thing pointed in the right direction and receiving a strong signal is going to be a physics challenge for sure. PALCA: One curious problem - you can't actually point the laser at Earth. You have to point it where the Earth is going to be when the light signal arrives. This point-ahead system is like throwing a pass to where a receiver is going to be in football. Now, laser light is made up of photons, and because the laser NASA is planning to use is not all that powerful, you need to capture every last photon you can from the satellite out in space. That's where Matt Shaw's work comes in. Shaw's lab is in the basement of a building at the Jet Propulsion Laboratory in Pasadena. He opens a plastic box to show me what looks like gold computer chips. MATT SHAW: So these are the largest single photon detectors of this kind that have been made. PALCA: That squeaking sound in the background is part of a special refrigeration system. These chips have to be cooled to almost absolute zero in order to work. SHAW: With these detectors, we can detect these very faint signals that are going to be coming back from this laser transmitter. PALCA: Using light to transmit data and video may be the future of space communications, but it's actually quite an old idea. Kevin Kelly says the same inventor who brought us the telephone built something called the photophone in the 1980s that transmitted sound using light from the sun. KELLY: Alexander Graham Bell demonstrated it right here in Washington, D.C., between a laboratory that was on the roof of a school just near the White House over to his laboratory that was just a few blocks away. PALCA: Talk about an inventor ahead of his time. NASA plans to launch its new deep space laser communication system in 2022. Joe Palca, NPR News. (SOUNDBITE OF KOLOTO'S "FOX TALES") Transcript provided by NPR, Copyright NPR.